The Irish certainly know their seafood! 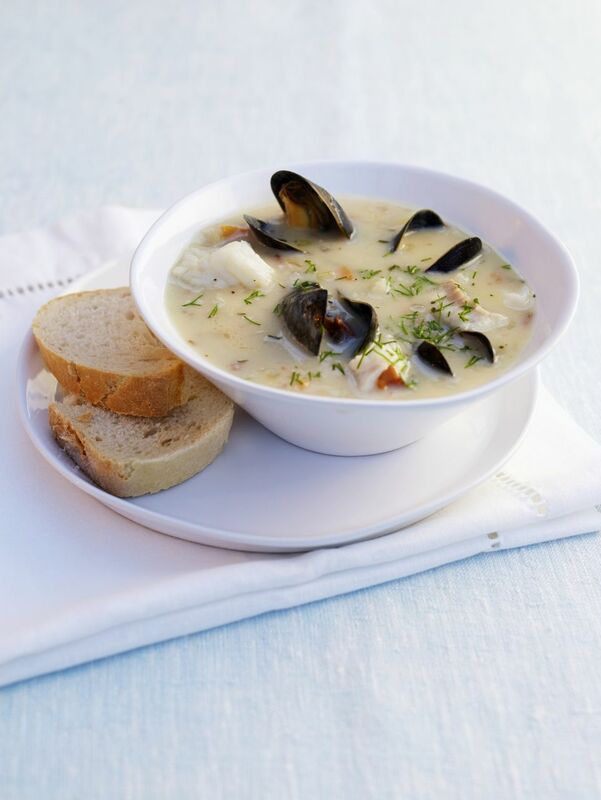 Here is a quick and easy way to prepare a great seafood chowder. Fresh mussels, fish, and shrimp, and a mix of vegetables are simmered in a broth of fish stock, milk, and cream - a hearty, satisfying chowder with lots of flavors! Any hearty fleshed fish can be used and feel free to substitute clams for the mussels if you like. This chowder is excellent as a meal with some good bread and a salad or as a starter for your next dinner party. Monks Bar and Restaurant is a famous Irish landmark in the village of Ballyvaughan, in County Clare, located in the West of Ireland. A Note About Mussels: The shells of fresh mussels should be closed before they are cooked. If you have any with open shells, tap its shell and it should close. Even if it closes slowly, its stit's alive. Any mussels that won't close are dead and should be discarded. mussels, cover, and steam until just open, about 2 to 3 minutes. Try not to overcook the mussels as they tend to get rubbery in texture with too much heat. Remove mussels with a slotted spoon and when cool, remove from shells, coarsely chop and set aside. Combine the fish stock (or clam juice) and milk in a large pot and bring to a simmer. Add the mixed vegetables and simmer until just beginning to soften about 6 to 8 minutes. Add the fish and shrimp and simmer until almost cooked through about 3 to 4 minutes. Stir in the cream, then slowly stir in the cornstarch/water mixture to thicken. Simmer for 5 minutes to combine flavors.